Founded in 1996, Vancouver Asian Heritage Month Society (VAHMS) is a non-profit society that is dedicated to recognizing Asian Canadian participation as an integral part of Canadian society. 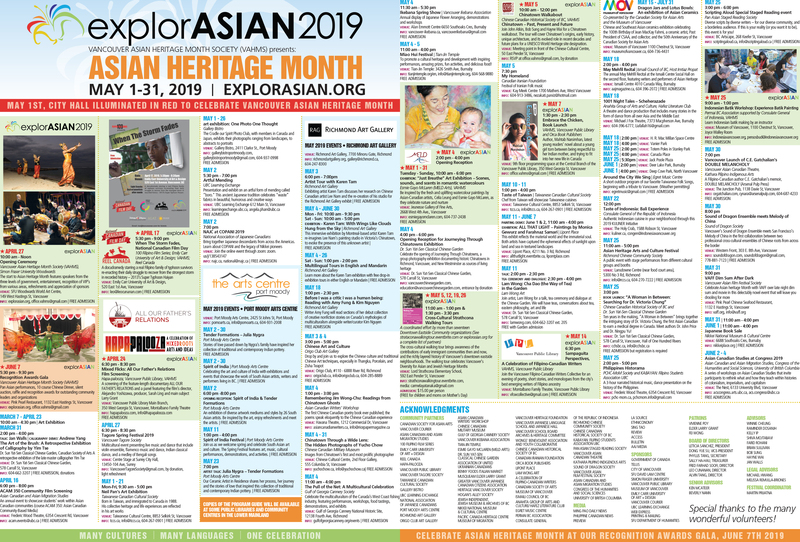 VAHMS organizes explorASIAN, an annual festival celebrating national Asian Heritage Month to promote understanding and appreciation of Asian-Canadian arts and culture in the month of May. The festival includes programs, activities and events produced in collaboration with various partners from the diverse communities in Metro Vancouver. To recognize Asian Canadian participation as an integral part of Canadian society and celebrate the hybridization of all arts and culture in Canada. To produce a dynamic and exciting festival that will inspire people to appreciate, recognize and celebrate Asian-Canadian arts and culture in our multicultural society. Celebrate Asian Heritage Month to promote understanding and appreciation for Asian-Canadian cultures. partner cultural organizations and events. VAHMS was founded in 1996 by Mishtu Banerjee, Mo-Ling Chui, Grace Eiko Thomson, Jim Wong-Chu and Winston Xin, following the beginning of Asian Heritage celebrations in the USA and Toronto, Canada. In 2001, Senator Vivienne Poy proposed a motion in the Senate to officially recognize Asian Heritage Month in the month of May. Other Canadian cities celebrating Asian Heritage Month include Victoria, Calgary, Edmonton, Winnipeg, Montreal, Toronto, Ottawa, Halifax and Fredericton.